Megocollector.com is devoted to more than collecting Mego toys. Megocollector.com is a compilation of interests. Collecting is the main focus of this site. Megocollector.com offers online references to various collections of toys, action figures, and Elvis records and memorabilia. All reference materials are available in the Categories section of Megocollector.com. Megocollector.com does not attempt to reinvent the wheel as there are many more sophisticated websites with graphic intensive and more extensive research material available. However, Megocollector.com offers a compilation of information not available anywhere else on the internet. Megocollector.com hopes that this site has provided something towards your journey into collecting. 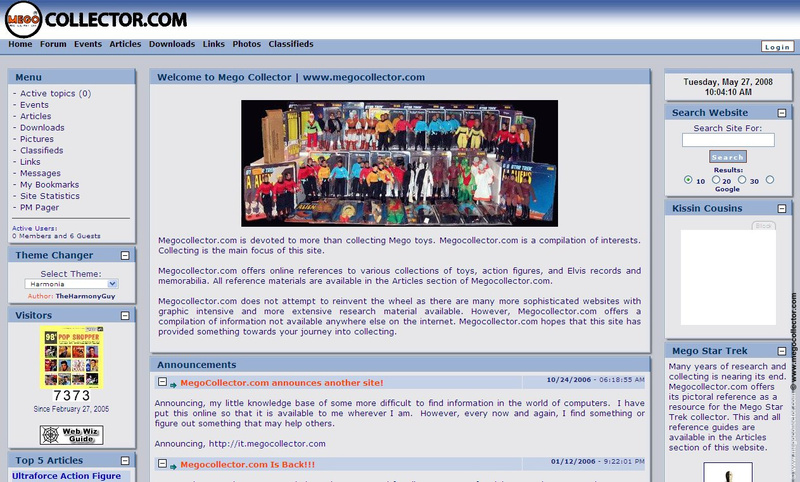 The above image is what Megocollector.com has looked like from 2004-2008. Megocollector.com has been in existence since 1998.